The effects of the most esoteric physics abound throughout your life. Take quantum mechanics, the theory that describes how tiny things behave. It’s everywhere! How else would you get so much data on a palm-sized terabyte hard drive? An international team of physicists, including many from IBM, have now taken storage down to the smallest level, by using magnetism to encode data on single atoms. The research is a proof of concept and probably won’t appear in your portable hard disk any time soon, but could have important applications for the future of computing. Natterer’s work build on previous efforts to create single-atom magnets. He started with holmium, one of the stranger elements on the periodic table. Lots of the electrons orbiting holmium’s nucleus buzz around without a partner, unlike more familiar elements, he explained. Single electrons have innate magnetic properties, because they’re essentially spinning electrical charges (not literally spinning—they have a quantum mechanical property, called spin, which is described by equations that look a lot like the equations of a spinning object). Magnetic fields arise from moving electric fields. Normally, these tiny magnetic fields would cancel out in paired electrons, but in elements like holmium, all those single electrons’ fields line up. That can turn the atoms into little metastable magnets, meaning they’re stable unless they get a kick, which can cause magnetic field to flip directions. The researchers embedded these holmium atoms in a metal, in this case magnesium oxide, which prevents holmium’s magnetic field from falling apart under the influence of other electrons or vibrations . That means it takes a stronger kick to flip each holmium atom’s magnetic field around. That lets these atoms “store” a field orientation for a long time. Much like a computer’s zeroes and ones, the orientation of that field encodes binary information. Essentially, the atoms themselves become a unit of data, called a bit. Using a so-called “scanning tunneling microscope” as the read head (like the needle of a record player) Natterer and his colleagues manipulated pairs of holmium atoms with tiny electric currents to store two bits worth of information, or four values. The atoms maintained their field orientation for a long time without flipping, meaning they proved a good storage medium. “For me, the most exciting part was that the holmium atoms never reversed their magnetization,” said Natterer. He and his colleagues published their results yesterday in the journal Nature. 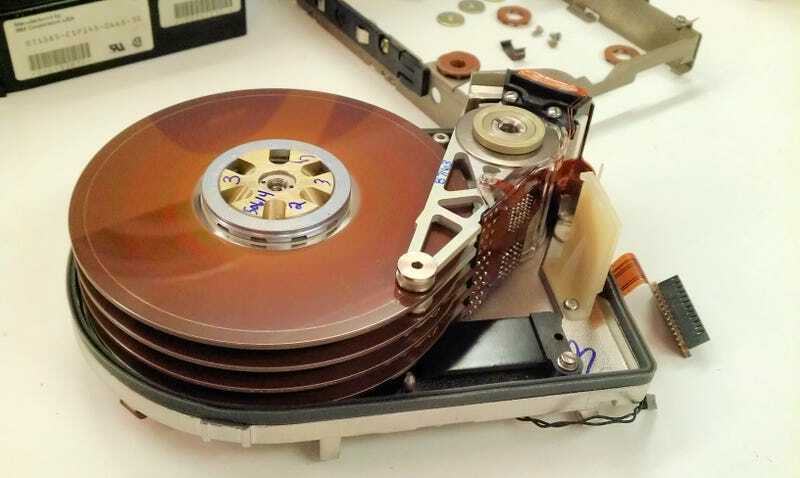 Plus, the magnetic tape needed to impart the field flip on these atoms would need to be so precise that any jostle or vibration might screw up the ability to read and write the data, he said.